Why Does the Finale of Sibelius’ Symphony No. 2 Feel So Joyful? Music Director Ludovic Morlot and the Seattle Symphony perform Sibelius’ magnificent Symphony No. 2 on March 22, 24 & 25. From the pulsing, flowing waters at the beginning of the first movement to the heroic themes of the finale, Sibelius’ Symphony No. 2 takes us on an immense journey. But there’s something about the final movement, with its sweeping melody and rich orchestration that invariably raises the goosebumps on our arms. How does Sibelius do it? Before Music Director Ludovic Morlot and the Seattle Symphony perform the work on March 22, 24 & 25, we wanted to explore how Sibelius creates the thrilling, emotional arrival that concludes his most beloved symphony. To find out, we followed the music back to the first movement. The symphony opens in the bright waters of spring, where Sibelius introduces the symphony’s motive — a simple, rising gesture of three notes. It begins in the strings and is answered by a choir of woodwinds reminiscent of bird calls. The movement progresses on through pastoral scenes in the horns, clarinets and oboes. For a composer most often associated with the cold, stark landscapes of Finland, the music is surprisingly warm and charming, likely inspired by his extended visit to Italy where he started his sketches for the Second Symphony. The inner movements of the symphony depart from the pastoral images of the first movement for darker reflections and haunting lines that echo Sibelius’ tragic first symphony. The opening motive returns, but here it is flipped on its head to create a descending line — our spirits sink along with the falling motive in the strings. The third movement opens in a burst of energy, frantic lines scurrying through the strings. We’re still caught in the tumult of the third movement. The shortest movement of the symphony, it propels us into the triumphant opening of the fourth movement. Finally, we arrive in the transcendent world of the finale, with a soaring theme in the violins. But the energy is still building — and we’re not yet free from the struggle of the second movement. 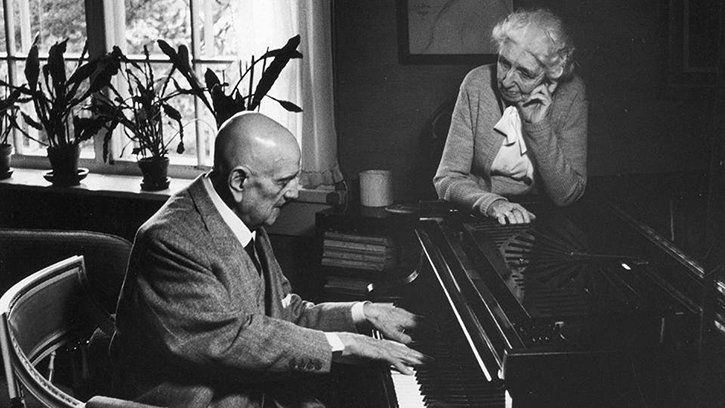 According to Aino Sibelius, his wife, the second theme was written in memory of her sister Elli Järnefelt, who had committed suicide. The struggle continues until almost at the end, Sibelius breaks free from his three-note motive as the music reaches — for the first time in the symphony — up to a fourth note. As the Finnish composer and scholar Erkki Salmenhaara notes, it creates a thrilling effect and a feeling of completion. We’ve left the haunting, searching music of the middle movements and arrived in the brilliant light of summer. Experience the gorgeous melodies and sweeping landscapes of Sibelius’ Symphony No. 2 with Music Director Ludovic Morlot and the Seattle Symphony on March 22, 24 & 25!